Feeling a bit negative from time to time is perfectly natural, but once cynicism, criticism, and pessimism become a habit, it weakens your recovery. Your attitude in life will have a huge impact on how the universe treats you. If you are negative all the time, it can create a self-fulfilling prophecy in which the act of predicting bad things causes it to happen – for example, the fact that you expect to fail means that you never try hard enough to make good things happen. 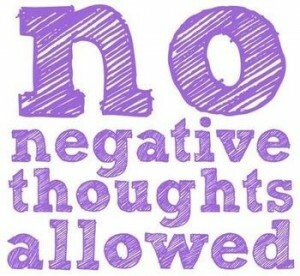 Negative thinking is learned behaviour, meaning you have it in your power to unlearn it. One way of doing this is to deliberately incorporate some tools into your life that allow you to identify, eliminate, and escape patterns of negative thinking. Here are 10 tools that may help you do just this. One of the biggest challenge when it comes to overcoming patterns of negative thinking is recognising when you do it. The fact that these patterns of thoughts are usually driven by habit energy means that you may be oblivious to it most of the time. Mindfulness is a tool that allows you to become more objective about your thoughts – it makes it easier for you to spot negative thinking. Most people who begin a mindfulness practice are usually shocked to find how much negative thinking they engage in. They may even begin to worry that being mindful is making them become negative, but this is not what is happening – looking at your thoughts more carefully just allows you to recognise more clearly what is going on inside of your head. If you benefit from cognitive-behavioural therapy (CBT) during your time in rehab, you will pick up some tools to help you challenge negative thoughts. Even if do not get to learn about CBT, you can still challenge these thoughts by looking at them rationally. For example – if you believe that others do not like you, it is important to ask yourself how you know this information – can you read minds? Developing self-compassion is all about learning to accept yourself. Much of the negativity that arises in your brain is there because you are being overly judgemental about yourself and other people. It also occurs because you are resistant to life and do not have faith in the power of planting positive karma seeds for your future (i.e. by doing the right things, the right things will start happening to you). One of the impacts of being caught up in addiction is that it can leave you feeling full of self-loathing. This means that developing self-compassion can feel a bit of a challenge at first, but you can use techniques such as loving-kindness meditation to help you. If you are really struggling due to excessive self-hatred, it can be helpful to spend some time with a therapist. A lot of negative thinking is irrational because it depends on your ability to accurately predict the future. If you honestly look back on your past life, you will probably notice that things rarely work out exactly as you expect them too. This means that your ability to predict the future is probably not very reliable. Every event is going to lead to a positive, neutral, or negative result – it is illogical to always expect the negative result because the odds are against it happening (it is more likely to be neutral or positive). Your physical well-being can have a huge impact on your attitude towards life, which is why it is important to eat a balanced diet and exercise every day. If you do not do this, you are likely to feel sluggish and lacking in energy; these physical sensations trigger negative thoughts. Your brain is part of your body, so if you do not take care of your body, your mental life will suffer as well. If you have been eating a poor diet up until now, you may need the help of a dietician to get back on track. One of the benefits of keeping a journal is that it can help you recognise when you are caught up in negative thinking. This documentation can also allow you to see patterns so you can figure out what is triggering these thoughts. The other benefit of journaling is that it can be a way to let of steam, and this may lessen your negativity (although focusing too much on the negative stuff while journaling may just encourage further negativity). Gratitude is the best antidote for negativity – it is not possible to feel grateful and negative at the same time. Even on your worst day, there will be things that are worth feeling grateful for, but the fact that you take these things for granted means that you do not appreciate them. A gratitude list is a deliberate attempt to remind yourself of the good things. You can do this as part of your journaling, and it is a way to transform your mind into a far more positive place. Smiling more can have a dramatic impact on the way you experience the world. If you tend to frown a lot, or look otherwise gloomy, it sends out a type of negative vibe to others. This can mean that these individuals react negatively towards you. By deliberately smiling, you encourage people to respond to you in a more positive manner. It might sound similar to cheating but acting ‘as if’ you are positive can be an effective technique for helping you to become more positive. It involves pretending to be positive until the day you realise that you are no pretending any more.